Visitors to Timucuan Ecological and Historic Preserve have an opportunity to explore thousands of years of history in the wetlands along Florida’s Atlantic coast. In addition to places and stories of the Timucua Indians and European colonists, the park includes sites related to cotton plantations, segregation in the South, and Florida’s ecosystems. These places reveal the natural and cultural history of this diverse region that has been the home of many peoples. After Ponce de León named and claimed Florida for Spain in 1513, Spanish Franciscan missionaries established missions in the area to convert the Timucua, translating religious texts from Spanish into Timucua and leaving us much of what we know today about the Timucua language. Long before the arrival of ships from Europe, America’s first peoples lived in present-day Florida, some of them in what is today the Timucuan Ecological and Historic Preserve. Although the European colonists called them by one name, the Timucua, several groups of loosely related bands who shared a common language, inhabited the region. The Timucua generally lived in large, fortified villages where they grew crops such as maize, squash, and beans. They also hunted and fished. A chief led groups of villages related by family ties. The Timucua had a highly stratified caste society, where heredity determined a person’s role in the larger group. Visitors to Timucuan Ecological and Historic Preserve can learn about the Timucua at Fort Caroline and the Ribault Club. A good place to begin is at the visitor center at Fort Caroline, which features artifacts and exhibits about Timucuan culture. Near Fort Caroline, a modern reconstruction of a Timucuan hut and shell mound interpret how people lived. The reconstructed hut would have been one of many huts that made up a village. Tall wooden poles would have surrounded a group of huts. The center of the village often held a ceremonial space. The shell mounds are piles of discarded oyster shells and clamshells. A complex society, the Timucua encountered all of the early colonial powers in Florida. Successive waves of explorers from Europe had an impact on Timucua life after Ponce de León named and claimed Florida for Spain in 1513. Over the next several hundred years, control of the area swung from Spain to France to Great Britain and, finally, to a fledgling United States in 1821. Armed conflict regularly brought soldiers through the area. Participation in fights either with or against colonists killed some Timucua. Though the first contact between the colonists and the Timucua people was peaceful, they were involved in some colonial battles that had roots far across the ocean. The park interprets the struggle of empires in Florida at Fort Caroline, which is included separately in this travel itinerary. Plantation was constructed in 1798. Missionaries also came to Florida. Established sometime during the 1570's, the San Juan del Puerto mission on Fort George Island was one of the largest. In the late 1500s, Franciscan monks attempted to convert the Timucuan to Catholicism, eroding Timucuan culture as tribal customs and practices changed to adopt European influences. Much of what we know today about the Timucua language is based on missionaries' work to translate religious texts from Spanish into Timucua. Father Francisco Pareja was an especially gifted linguist who created parallel Spanish and Timucua catechisms, a dictionary, and a description of Timucua grammar between 1612 and 1627. Within a century, missionary zeal died out as other concerns, like fighting with the British, took over. 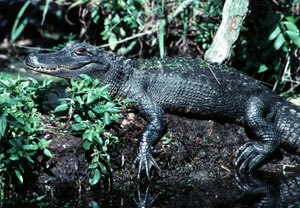 The British began attacking Florida in the 1760s with the goal of gaining some territory as a colony. They frequently targeted the Spanish missions, some of which moved closer to St. Augustine for protection. The mission at San Juan del Puerto was attacked and destroyed in 1736. Its inhabitants reformed the mission outside San Augustine but it closed within a few years. As their culture changed through contact with Europeans, including war and diseases, the number of Timucua decreased. By the late 1600s, only about 550 Timucua lived in Florida, and none are known to remain today. Kingsley Plantation, a cotton plantation, was the home of Zephaniah Kingsley. The home site and remains of many slave cabins and other outbuildings tell the story of 18th and 19th century Florida. Zephaniah Kingsley and his wife Anna Madgigne Jai, a former slave from Senegal, moved to the island in 1814. Though they were not the first to live here, the plantation gets its name from the Kingsleys. The Kingsleys were successful planters whose holdings gradually expanded to include tens of thousands of acres, several other plantations in Florida, and hundreds of slaves. Visitors can take self-guided walking tours of the plantation, including the slave quarters and barn. Rangers also lead guided tours. 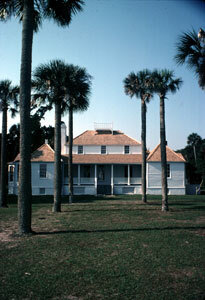 The Ribault Club on Fort George Island. A group of slave cabins is arranged in a semi-circle a short distance from the plantation house. Made of tabby--a mixture of lime, sand, water, and shells (usually oyster shells discarded long ago by the Timucua), these cabins housed the slaves who worked in the Kingsley fields. A demonstration garden features crops grown on the plantation such as long-staple Sea Island cotton prized for its softness, indigo, okra, squash, and beans. Slaves on the island worked under the so-called task system where each slave was assigned a fixed amount of work each day. After finishing their work, the slaves tended to the needs of their families and community by growing their own food. Slaves expressed themselves in music, dance, and religious practices that were their own rather than the customs of their owners. Until the end of the Civil War, agriculture dominated life on Fort George Island. The Rollins family purchased the island in 1869 and, following several failed attempts to turn a profit from growing grapes and oranges, began to use the island for recreation and as a tourist destination, which led to the construction of hotels and country clubs. Visitors can drive or take a ferry to Fort George Island where the visitor center at the Ribault Club highlights the island’s long history. Built in 1928, the clubhouse for the Ribault Club is a remnant of “Roaring Twenties” society life. Created as a social club for the wealthy, the club had as members men and women from major East Coast cities like New York, Philadelphia, Boston, Wilmington, and Pittsburgh. The visitor center interprets Timucua life on and around Fort George Island, particularly along the St. Johns River. A video recounts the history of the club. Segway tours and a CD tour to play on a car stereo are also available. 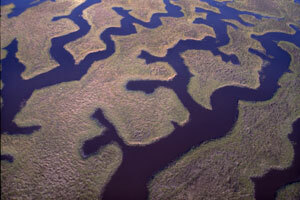 The Theodore Roosevelt Area preserves a landscape very similar to that of “Old Florida” during the time of the Timucua. This area highlights the ecological diversity of Florida and provides opportunities for hiking and bird watching, as does the Cedar Point part of the park. An alligator suns on a log in the Theodore Roosevelt Area. Outdoor exhibits at American Beach tell the story of African American life in segregated Florida during the early 1900s. With most beaches closed to black people, wealthy African American insurance company president A. L. Lewis bought and divided land on Amelia Island for his employees and the black general public in 1935. Following World War II, the beach community he created exploded in popularity, until the Civil Rights Act of 1964 outlawed segregation in public spaces and opened formerly closed areas to African Americans. After the passage of the Civil Rights Act, the importance of American Beach declined. The National Park Service preserves one of the defining sand dunes of the area—an important natural feature among the beach houses of this historically black vacation community. Visitors can see the dune and learn about the social and cultural history of American Beach through outdoor interpretive signs. Timucuan Ecological and Historic Preserve protects cultural and natural resources that reflect the stories of the people who settled this part of Florida. From the Timucua to the Jim Crow South, the Preserve records the culturally diverse history of the coastal wetlands of Florida’s Atlantic coast from before the Spanish and other Europeans arrived until well into the 20th century. Timucuan Ecological and Historic Preserve, a unit of the National Park System, includes several sites around Jacksonville, FL such as Fort Caroline, the Kingsley Plantation, Theodore Roosevelt Area, Cedar Point, and American Beach. The main visitor center is located at 12713 Fort Caroline Rd. in Jacksonville, FL. Visitors interested in learning more about the Timucua should also visit the Ribault Club, located at 11676 Palmetto Ave. in Jacksonville. Click here for National Register of Historic Places files for Fort Caroline: text and photos. The visitor center at Fort Caroline is open daily from 9:00am to 5:00pm. All National Park Service areas of the Timucuan Preserve are closed on Thanksgiving, December 25, and January 1. For more information, visit the National Park Service Timucuan Ecological and Historic Preserve website or call 904-641-7155. Sites within the Timucuan Ecological and Historic Preserve have been documented by the National Park Service’s Historic American Buildings Record. Timucuan Ecological and Historic Preserve is also featured in the National Park Service Along the Georgia Florida Coast Travel Itinerary and in the Places Reflecting America's Diverse Cultures: Explore their Stories in the National Park System Travel Itinerary.